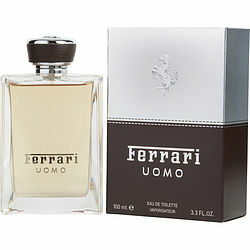 Ferrari Uomo cologne for men, which was released in 2009 by the design house Ferrari, has a sophisticated yet subtle aromatic scent. It opens with a sharp citrus note followed by bergamot with middle notes of leather and nutmeg that mix beautifully and last throughout. Base notes of tonka bean and patchouli blend together to create a rich and woody masculine casual scent with a hint of warm spice for the sophisticated man. Ferrari Uomo is massively underrated IMO. Its layers are evocative of the Tuscan countryside - citrus, wood and sweetened leather. If I were to draw a comparison, I'd say this can be defined as an inexpensive analog to something between Tom Ford Tuscan Leather and Dior Fahrenheit. Yeah - aside from its shorter longevity, it's that good. Easy dumb grab for such a low price.